When going to Chile you always consider Patagonia (we talk about Puerto Natales and Torres del Paine), Atacama Desert and Easter Island - not to mention Santigo as it is the only hub to get to above mentioned points. However only a handful of travelers also head to the Lake District which is actually a shame. Yes, Torres del Paine is breathtaking and perhaps Patagonian landscape is unique in the world, but the Lake District around Puerto Varas, Puerto Montt and the peninsula of Chiloé is not less spectacular. In fact I was more blown away by the latter one to be honest as I prefer places without tons of German and European tourists (I never mind when we meet fellow citizens but they have to be in an acceptable amount). The interesting point is that especially the lake district has a big connection with Germany thanks to immigrants from Germany who came here a long time ago already. Now they have German schools and even the typical cake and coffee service in the afternoon, which they still call “Kuchen” just like we do in german. We arrived by bus from San Carlos de Bariloche (a nice but quite unimpressive place compared to Puerto Varas) until we changed to the hotel car at the bus terminal of Puerto Varas. The drive was approximately 20 minutes and we had the honour to be chauffeured by the head of guides and tours - he was so nice and explained us all the areas and activities while we were driving along the beautiful lake. We talked a lot about foreign destinations and found out that he travelled A LOT, which is quite uncommon for Chilean citizens. It was a very interesting talk and so we arrived what seemed like four minutes. Only when we entered the doors and were offered a full view of the landscape, we realised the volcano looking fab through the vast floor-to-ceiling glasses of Awa Hotel’s lobby. Check-in went quickly and it didn’t take a minute until we were toasting with two excellent Pisco Sours in front of the most impressive view of the last days. Since we had a full board package, we asked if we could head down for a light lunch which was no problem at all, however being 3.30 already they only had a limited, smaller snack menu. Even tough I was disappointed first, in the end the options turned out to be very good with a huge seafood platter and a ham and cheese plate to share. Of course another Pisco Out was not to be declined. Totally full and slightly drunk, we headed towards our room. All rooms and suites at the Awa are lake-facing so there is no bad or disappointing view. While the suites are located at the corners, our room was an entry-level double room but oh la la! Never would I have expected to find one of the coolest room layouts in a place like Chile. Sorry for the many prejudices but I just didn’t know that the end of the world has so many luxurious outposts and even better hotels than we have in Europe. Once we opened the door, we were welcomed by a small entree that featured a sideboard with a water bottle and glasses, the minibar and fresh flowers. To the left was the spacious bathroom with double vanities, a huge bath tub for two persons and a walk-in shower with glasses onto the bedroom to overlook the picturesque lake and the volcano. This shower experience was really on par and when staying with a person not so familiar, you can simply close the blinds and have your private bath heaven. Of course there was a toilet as well, separated in a cool black chamber. The highlight of the bath were the jacuzzi in the tub that worked well as well as the bath amenities what seemed to be like a copy of L’Occitane - just the Chilean version with identical bottles and smell. Bath salts were provided as well and plenty of bath towels were available. Generally, the housekeeping was superb with two services a day and they even replaced a broken pottery in the bathroom so 10/10 on that. I mean if you wouldn’t have the pictures proving that the room was on par, you most likely wouldn’t believe my statement I guess. With full floor-to-ceiling-windows we could actually soak up the massive view what seems to be one of the best (if not the best) I have ever had from an entry-level room. When the sun set, Lukas and me were relaxing on the day bed next to the open fireplace (that even works actually) holding a glass of quite good Rosé house wine (included in the Full board package) and dreaming of never leaving the place. All that’s left to say is that besides the flawless interior design (10/10) I also fell in love with the beds - heavenly bed itself plus top bedding. If I had to rate the hotel solely on the room it would be a totally fair 10. One of the highlights at the AWA is the direct access to the lake, the individually arranged tours as well as the design. I absolutely tend to love hotels on the lakeside, as I think lakes are always more refreshing than pools or the sea (especially the Mediterranean), so I was happy to see AWA was providing water sports equipment including paddle boards, kayaks, jet-skis and a motorboat. While all motor equipment is at an extra charge, we had lots of fun with the classic non-motor stuff. You can go as far as you want on the stand up paddle as the water is really calm and flat as a pancake to say it in British words. We actually preferred to go to the lake to refresh than spend time at the indoor pool, which looked quite nice and the water was also perfectly tempered. Next to the indoor pool is a very hot pool, a sauna and a steam bath along six day beds to relax. While other guests found it odd that you have to pass by the restaurant entrance to get to the spa, we didn’t mind walking around in robes as the hotel has very few rooms and is a retreat anyways. You won’t meet business men in suits ever. Another huge point where our expectations have been exceeded was the activities programme. Already when we were picked up in Puerto Varas, the head of tours was interviewing us which tour we would like to book and although things normally never work out as planned in South America, the rafting tour was booked and I finally could fulfil one of my dreams to participate in white water rafting. I was terribly nervous at the beginning but when we were floating around in the Pichilemu river under the massive volcano, it was an overwhelming feeling and I wouldn’t want to miss this day ever. AWA made this tour possible and we didn’t end up paying for it as part of their Full Board programme. After the tour we came back to the hotel and were welcomed by a round of Pisco Sours before we changed into the evening attire and headed towards dinner. There we arrived at the only downside of the hotel: the restaurant staff. They seemed to be a little helpless and were not familiar with the service process. Although the food was flawless for us every day (and really amazing food presentations & quality considering you are at in the middle of nowhere), we registered a British couple who send the food back several times due to quality issues. I cannot apply the same to our dishes, we both had different options and they were all fine and arrived at the same time. Also the selection of house wines was better than expected and we ended up having had a great evening despite very average service. Breakfast is on the small site, not even offering orange juice (at least we were never asked if we would like to have one - there was none at the buffet) but a small selection of healthy options with fresh strawberry juice which was the plus side. Egg dishes were freshly prepared and of good quality as well, however service was again not too good. I don’t want to write in a bad way as they may try their best but just never learned it - I don’t know. 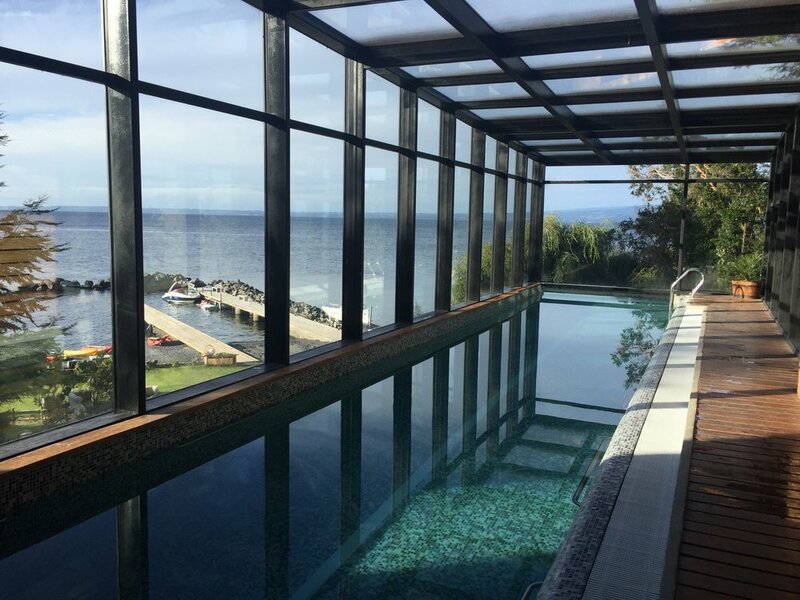 Overall the stay was simply stunning and we were totally happy at the AWA Hotel. 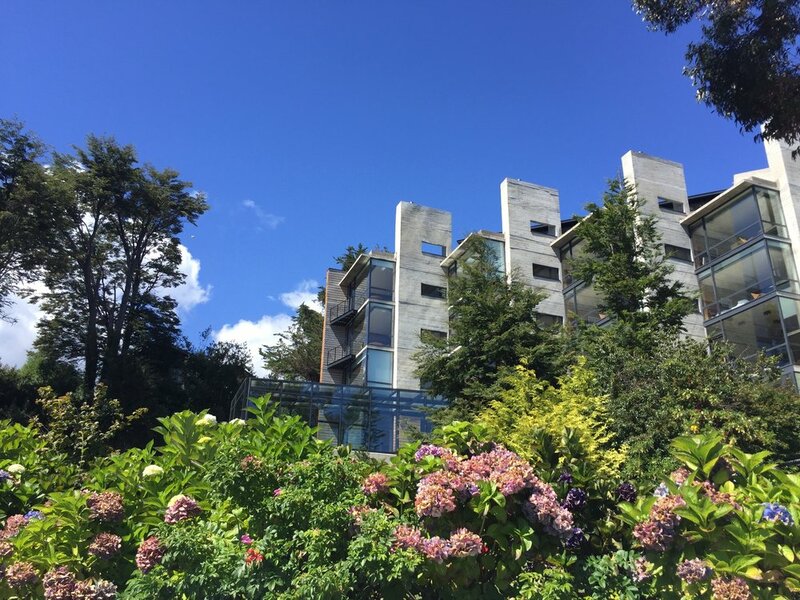 We left with the feeling that this place - while not cheap - is totally worth the money and the detour should you not plan to make a stop in Puerto Varas and the Lake District. Honest 8.5 out of 10 points as the entire hardware was totally perfect, the rooms stunning and the views unbelievable. I wish we would have such a hotel in Austria, probably you wouldn’t be able to afford it.